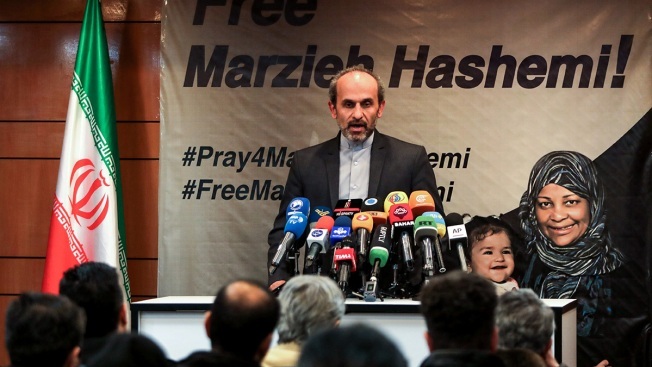 Peyman Jebelli, chief of the world service for the Islamic Republic of Iran Broadcasting (IRIB) and head of its 24-hour English- and French-language news network Press TV, speaks during a press conference in the capital Tehran on Jan. 16, 2019. Jebelli said that one of its journalists and her son have been detained in the U.S. on unspecified charges. U.S.-born news anchor Marzieh Hashemi was arrested on arrival at St. Louis Lambert International Airport on Sunday, according to family and friends cited by Press TV.